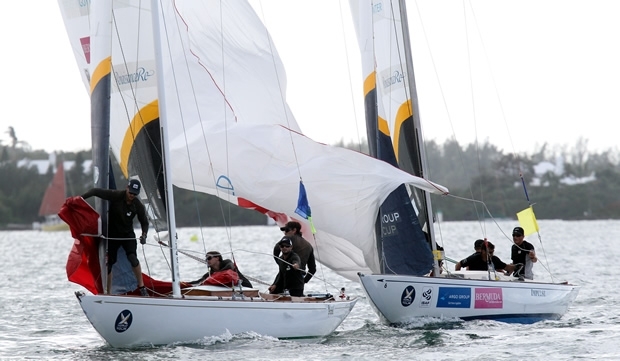 Keith Swinton’s Black Swan Racing from Australia and Chris Steele’s 36 Below Racing from New Zealand have advanced to the Quarter Finals at the 67th annual Argo Group Gold Cup, the penultimate event on the 2015 World Match Racing Tour. Headlining the Quarter Finals is Taylor Canfield’s US One team from the U.S. Virgin Islands. Canfield’s crew is the only one to go undefeated through Qualifying. That earned the crew the right to choose their opponent and they’ll square off against Steele’s 36 Below Racing. Canfield won the Argo Group Gold Cup in 2012 and has placed third each of the past two seasons. He chose to race Steele because the Kiwi is the No. 8 seed in the Quarter Finals. Other Quarter Final matches pit Phil Robertson’s WAKA Racing against Adam Minoprio’s BlackMatch in a battle of Kiwi teams. “The winner picks up the tab Sunday night,” said Minoprio. Eric Monnin’s Team SailBox races Björn Hansen’s Nautiska Racing from Sweden. “People have a tough time telling Swedish and Swiss apart, so we’re going to help them out,” said Hansen.